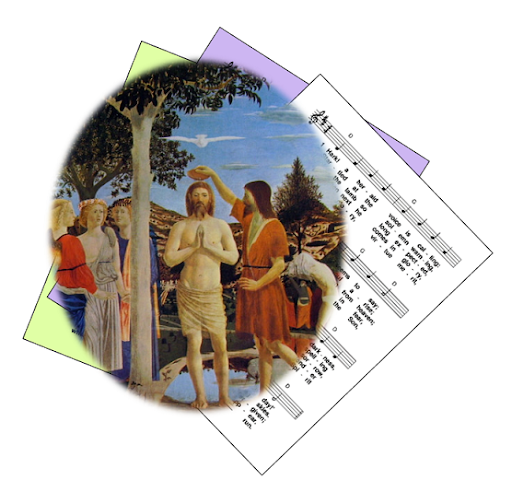 A selection of hymns and songs, based on themes from the Roman Catholic lectionary for the feast of the Baptism of the Lord / First Sunday of Ordinary Time, Year B. This is the first Sunday of Ordinary Time. The feast is a marked change from the baby Jesus of the the Christmas season, to the adult Jesus who is close to starting his public ministry. In southern hemisphere countries, mid-January is still holiday time, so there is a temptation to use Christmas material "one more time", but this isn't supported by the day's readings. First: Isaiah - Come to the water, you who are thirsty - with you I will make an everlasting covenant - Let the wicked abandon their ways - the word that goes from my mouth does not return to me empty. Psalm: Isaiah 12 - With joy you will draw water from the wells of salvation / Truly God is my salvation / Give thanks to the Lord / Sin a psalm to the Lord. Second: I St John 5 - Whoever believes that Jesus is the Christ has been begotten by God ... Jesus came by water and blood .. with the Spirit as another witness. Gospel: Mark 1 - John teaches that someone more powerful than him is coming. Jesus is baptised,and when he comes out of the water the heavens open, the Spirt descends like a dove, and a voice says "You are my Son, the Beloved, my favour rests on you". Jesus is publicly revealed as Son God. Baptism, prophecy and the Holy Spirit. Water.